By SUSAN LEATHERSFranklin’s annual Arbor/Earth Day Celebration was anything but boring Saturday at Pinkerton Park. Nicholas Malicoat of Ohio gets climbing tips from Tim Kovar of Tree Climbing Planet. Little Nicholas Malicoat didn’t plan to climb a tree on Saturday, but he did. The 6-year-old from Cleveland, Ohio was spending a long weekend, mini-vacation in Franklin with his parents Gary and Linda Stouffer. After breakfast at Puckett’s, mom went shopping and the men went in search of a playground. What they found was the city’s annual Arbor/Earth Day celebration at Pinkerton Park. Instead of a swishing down a slide, Nicholas ascended into a large tree using the same rope-and-saddle method that canopy researchers use. 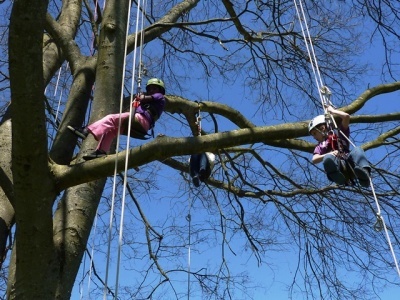 Other kids braved a zipline that let them sail through the air between two giant oak trees. A large crowd turned out on the beautiful, if cool, day for the 8th annual celebration, designed to promote awareness and appreciation of trees as well as to commemorate Earth Day. Beth Adams, a member of the city’s Tree Board, estimated that at least 150 people took advantage of the free fun event. Most took home a free sapling to plant in their own yard. The zipline was provided by Davey Tree while the tree climbing equipment and guidance was provided by Tim Kovar of Tree Climbing Planet. While the kids were zipping and climbing, there were plenty of exhibits and information, along with free hot dogs provided of Middle Tennessee Electric Membership Cooperation, to keep everyone busy. Franklin again received its official Tree City designation from the State of Tennessee.